Ever see hitters swing at pitches way out of the strike zone and wonder what is wrong with them? If so, the reason lies in an X. Check out why. We’ve all seen hitters swing at pitches in the dirt or over their heads and wondered what is wrong with them. As well as watching pitchers get batter after batter out without throwing very fast or seeming to have very good stuff. So, what’s up? What’s happening that makes good hitters make poor decisions and unable to hit seemingly hittable pitchers? The reason for both of these is the same, and it has to do with an X. It’s also proof that you don’t have to throw strikes to get batters out. I know how crazy this sounds. From the time we first make our arms go in a circle, pitchers are obsessed with throwing strikes. They hear it yelled from the dugout, screamed from the stands, and repeated over and over again on the ride. “Just throw strikes” is one of the most uttered, and yet totally useless pieces of information ever, in the history of the world of stupid things said. What I’m talking about involves the time it takes a hitter to swing. 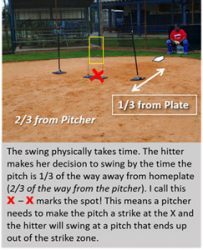 The physical act of swinging takes time, but a hitter spends most of that time trying to pick up clues from the pitch to figure out where the ball is going to end up – so she can then decide if she even wants to swing at it or not. As a result, the hitter can’t wait until the ball is at the plate to decide to swing – she’s got to swing sooner. And it’s this “gotta swing sooner” part that is our advantage as a pitcher. The swing takes 1/3 of the flight time of the pitch, which means the hitter has about 2/3 of the pitch flight to see, identify and swing at a pitch. The longer that pitches look the same and then end up in different places in the zone, the more deceptive the pitcher becomes. So, there’s this magical spot, about 2/3 of the way from the pitcher and 1/3 of the way out in front of the hitter, where a hitter decides to swing or not. I’ve started calling this spot X, as in “at the X” or “X marks the spot”. Here’s the great thing about this X – if the pitch is a strike at the X then there’s a pretty high chance that the batter will swing. This is why you see hitters swinging at pitches that aren’t even close to the strike zone, or pitchers that don’t throw very hard and yet nobody can hit them. Take a look at Pictures 1 & 2, the pitch is clearly a strike at the X in Picture 1, but by the time that same pitch gets to homeplate, it’s too high and out of the zone (Picture 2). The batter in this instance would have swing at a pitch middle of the zone, only to end up with a pitch near her nose when it crossed the plate. 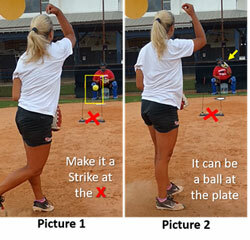 Alexis Osorio, the riseball pitcher from University of Alabama, made a career getting hitters to swing at pitches that were out of the zone (because they were a strike when they crossed the X), as well as taking pitches that were in the zone. The power of the X also works in an anti-strike way. For instance, if a pitch is out of the zone at the X, the hitter believes it will be out of the zone at the plate – so they don’t swing. That’s one reason you see hitters take really good pitches for strikes and you’re wondering “what’s wrong with you, that was a strike?”. Well, nothing’s wrong with them – the pitch wasn’t hittable when it crossed the X but by the time it crossed the plate it had either bent back into the strike zone or rose up into it in the case of a low rise. Really good pitchers do their best to avoid throwing strikes, and yet they’ve somehow got to get hitters out or they wouldn’t be considered really good! Well, they do it by using the power of the X – they make their pitches appear to be hittable when they cross the X, only to end up unhittable when the bat goes through the zone. Not only is this concept simple, but it’s super powerful for pitchers because it makes sense, and it totally relieves them of the stress associated with “just throwing strikes”. Today’s strike zone is the size of a toaster and that puts an enormous amount of pressure on pitchers. But if we’ll get them to understand their pitches don’t need to move 3 more inches or jump over a bat – but instead simply need to appear to be a strike at the X, then we’ll start having braver, more powerful pitchers that will ultimately be more successful! For more help with your pitchers check out the incredible amount of advanced level information we’ve packed into the Pitching Summit Vault membership. Learn from the top college pitching coaches in the country and discover what they do to make their pitchers successful!